Steve's pro bono conference work includes chairing sessions at four World Urban Forums (Barcelona, Vancouver, Nanjing and Rio de Janeiro - "You're a great moderator" - Judith Rodin, President, Rockefeller Foundation ). In 2004 he was keynote speaker at the Dutch-Flemish Association of Investigative Journalists VVOJ conference in Rotterdam. 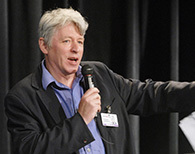 In 2007 Steve chaired the widely televised 10th anniversary Sofie Prize debate in Oslo and more recently has been on and chaired panels at the Reframing Rio - Fair Ideas conference in Brazil (2012), spoken on Rwanda at the Frascati Theatre in Amsterdam (2013), fronted the streaming of the Humanitarian Water and Food Awards (2014), and spoken on the future of the Commonwealth on a panel at the University of London (2016). He has also served on the One World and Grierson Award international documentary juries.